"Engels" redirects here. For other uses, see Engels (disambiguation). 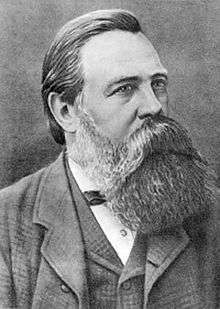 Friedrich Engels (English /ˈɛŋɡəlz/ or /ˈɛŋəlz/; German: [ˈfʁiːdʁɪç ˈɛŋəls]; 28 November 1820 – 5 August 1895) was a German philosopher, social scientist, journalist, and businessman. He founded Marxist theory together with Karl Marx. In 1845, he published The Condition of the Working Class in England, based on personal observations and research in Manchester. In 1848, he co-authored The Communist Manifesto with Karl Marx, though he also authored and co-authored (primarily with Marx) many other works, and later he supported Marx financially to do research and write Das Kapital. After Marx's death, Engels edited the second and third volumes. Additionally, Engels organised Marx's notes on the Theories of Surplus Value, which he later published as the "fourth volume" of Capital. He also made contributions to family economics. "You have paid more heed to other people, to strangers, and have taken no account of your mother's pleas. God alone knows what I have felt and suffered of late. I was trembling when I picked up the newspaper and saw therein that a warrant was out for my son's arrest." When his mother wrote, Engels was in hiding in Brussels, Belgium, soon to make his way to Switzerland. In 1849, he returned to the Kingdom of Bavaria for the Baden and Palatinate revolutionary uprising. At 17, Friedrich had dropped out of high school due to family circumstances. He spent a year in Barmen. 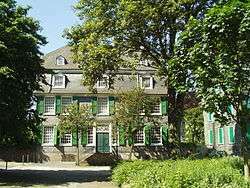 In 1838, his father sent the young man to work as a nonsalaried office clerk at a commercial house in Bremen. His parents expected that he would follow his father into a career in business. His revolutionary activities disappointed them. It would be some years before he joined the family firm. Whilst at Bremen, Engels began reading the philosophy of Hegel, whose teachings dominated German philosophy. In September 1838, he published his first work, a poem entitled "The Bedouin", in the Bremisches Conversationsblatt No. 40. He also engaged in other literary and journalistic work. Also while at Bremen, Engels began writing newspaper articles critiquing the societal ills of industrialisation. He wrote under a pseudonym, Friedrich Oswald, to avoid connecting his life in a Pietist industrialist family with his provocative writings. In 1842, his parents sent the 22-year-old Engels to Manchester, England, a manufacturing centre. He was to work in Weaste in the offices of Ermen and Engels' Victoria Mill, which made sewing threads. Engels' father thought that working at the Manchester firm might make his son reconsider some of his liberal opinions. On his way to Manchester, Engels visited the office of the Rheinische Zeitung and met Karl Marx for the first time. They were not impressed with each other. Marx mistakenly thought that Engels was still associated with the Berliner Young Hegelians, with whom Marx had just broken. In Manchester, Engels met Mary Burns, a fierce young working woman with radical opinions. They began a relationship that lasted 20 years until her death in 1863. The two never married, as both were against the institution of marriage. While Engels regarded stable monogamy as a virtue, he considered the current state and church-regulated marriage as a form of class oppression. Burns guided Engels through Manchester and Salford, showing him the worst districts for his research. While in Manchester between October and November 1843, Engels wrote his first economic work, entitled "Outline of a Critique of Political Economy." Engels sent the article to Paris, where Marx published it in the Deutsch–Französische Jahrbücher in 1844. While observing the slums of Manchester in close detail, Engels took notes of its horrors, notably child labour, the despoiled environment, and overworked and impoverished labourers. He sent a trilogy of articles to Marx. These were published in the Rheinische Zeitung and then in the Deutsch–Französische Jahrbücher, chronicling the conditions among the working class in Manchester. He later collected these articles for his influential first book, The Condition of the Working Class in England (1845). Written between September 1844 and March 1845, the book was published in German in 1845. In the book, Engels described the "grim future of capitalism and the industrial age", noting the details of the squalor in which the working people lived. The book was published in English in 1887. Archival resources contemporary to Engels' stay in Manchester shed light on some of the conditions he describes, including a manuscript (MMM/10/1) held by special collections at the University of Manchester which recounts cases seen in the Manchester Royal Infirmary, where industrial accidents dominate and which resonates with his comments on the deformed persons seen walking round Manchester as a result of such accidents. Engels continued his involvement with radical journalism and politics. He frequented areas popular among members of the English labour and Chartist movements, whom he met. He also wrote for several journals, including The Northern Star, Robert Owen’s New Moral World, and the Democratic Review newspaper. Engels decided to return to Germany in 1844. On the way, he stopped in Paris to meet Karl Marx, with whom he had an earlier correspondence. Marx had been living in Paris since late October 1843, after the Rheinische Zeitung was banned in March 1843 by Prussian governmental authorities. Prior to meeting Marx, Engels had become established as a fully developed materialist and scientific socialist, independent of Marx's philosophical development. In Paris, Marx was publishing the Deutsch–Französische Jahrbücher. Engels first met Marx at the Café de la Régence on the Place du Palais, 28 August 1844. The two quickly became close friends and remained so their entire lives. Marx had read and was impressed by Engels' articles on The Condition of the Working Class in England. Marx adopted Engels' idea that the working class would lead the revolution against the bourgeoisie as society advanced toward socialism, and incorporated this as part of his own philosophy. In late May 1845 Engels published the English version of his new book. He wrote, "A class which bears all the disadvantages of the social order without enjoying its advantages…Who can demand that such a class respect this social order?" Engels stayed in Paris to help Marx write The Holy Family. It was an attack on the Young Hegelians and the Bauer brothers, and was published in late February 1845. Engels' earliest contribution to Marx's work was writing for the Deutsch–Französische Jahrbücher, edited by both Marx and Arnold Ruge, in Paris in 1844. During this time in Paris, both Marx and Engels began their association with and then joined the secret revolutionary society called the League of the Just. The League of the Just had been formed in 1837 in France to promote an egalitarian society through the overthrow of the existing governments. In 1839, the League of the Just participated in the 1839 rebellion fomented by the French utopian revolutionary socialist, Louis Auguste Blanqui. However, as Ruge remained a Young Hegelian in his belief, Marx and Ruge soon split and Ruge left the Deutsch–Französische Jahrbücher Nonetheless, following the split, Marx remained friendly enough with Ruge that he sent Ruge a warning on 15 January 1845 that the Paris police were going to execute orders against him, Marx and others at the Deutsch–Französische Jahrbücher requiring all to leave Paris within 24 hours. Marx himself was expelled from Paris by French authorities on 3 February 1845 and settled in Brussels with his wife and one daughter. Having left Paris on 6 September 1844, Engels returned to his home in Barmen, Germany, to work on his The Condition of the Working Class in England, which was published in late May 1845. Even before the publication of his book, Engels moved to Brussels in late April 1845, to collaborate with Marx on another book, German Ideology. While living in Barmen, Engels began making contact with Socialists in the Rhineland to raise money for Marx's publication efforts in Brussels. However, these contacts became more important as both Marx and Engels began political organising for the German Workers Party. From 1845 to 1848, Engels and Marx lived in Brussels, spending much of their time organising the city's German workers. Shortly after their arrival, they contacted and joined the underground German Communist League. 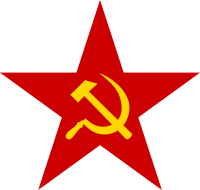 The Communist League was the successor organisation to the old League of the Just which had been founded in 1837, but had recently disbanded. Influenced by Wilhelm Weitling, the Communist League was an international society of proletarian revolutionaries with branches in various European cities. The Communist League also had contacts with the underground conspiratorial organisation of Louis Auguste Blanqui. Many of Marx's and Engels' current friends became members of the Communist League. Old friends like Georg Friedrich Herwegh, who had worked with Marx on the Rheinsche Zeitung, Heinrich Heine, the famous poet, a young doctor by the name of Roland Daniels, Heinrich Bürgers and August Herman Ewerbeck all maintained their contacts with Marx and Engels in Brussels. Georg Weerth, who had become a friend of Engels in England in 1843, now settled in Brussels. Karl Wallau and Stephen Born (real name Simon Buttermilch) were both German immigrant typesetters who settled in Brussels to help Marx and Engels with their Communist League work. Marx and Engels made many new important contacts through the Communist League. One of the first was Wilhelm Wolff, who was soon to become one of Marx's and Engels' closest collaborators. Others were Joseph Weydemeyer and Ferdinand Freiligrath, a famous revolutionary poet. While most of the associates of Marx and Engels were German immigrants living in Brussels, some of their new associates were Belgians. Phillipe Gigot, a Belgian philosopher and Victor Tedesco, a lawyer from Liège, both joined the Communist League. Joachim Lelewel a prominent Polish historian and participant in the Polish uprising of 1830–1831 was also a frequent associate. The Communist League commissioned Marx and Engels to write a pamphlet explaining the principles of communism. This became The Manifesto of the Communist Party, better known as the Communist Manifesto. It was first published on 21 February 1848 and ends with the world-famous phrase: "Let the ruling classes tremble at a Communistic revolution. The proletariat have nothing to lose but their chains. They have a world to win ... Working Men of All Countries, Unite!" There was a revolution in France in 1848 that soon spread to other Western European countries. This event caused Engels and Marx to go back to their home country of Prussia, specifically the city of Cologne. While living in Cologne, they created and served as editors for a new daily newspaper called the Neue Rheinische Zeitung. Besides Marx and Engels, other frequent contributors to the Neue Rheinische Zeitung included Karl Schapper, Wilhelm Wolff, Ernst Dronke, Peter Nothjung, Heinrich Bürgers, Ferdinand Wolf and Carl Cramer. Friedrich Engels' mother, herself, gives unwitting witness to the effect of the Neue Rheinische Zeitung on the revolutionary uprising in Cologne in 1848. Criticising his involvement in the uprising she states in a 5 December 1848 letter to Friedrich that "nobody, ourselves included, doubted that the meetings at which you and your friends spoke, and also the language of (Neue) Rh.Z. were largely the cause of these disturbances." At the time of this letter, Friedrich Engels's even more dangerous involvement in the revolutionary uprisings in Baden and the Palatinate in 1849, still lay ahead of him. Engels' parents hoped that young Friedrich would "decide to turn to activities other than those which you have been pursing [sic?] in recent years and which have caused so much distress." At this point Friedrich's parents felt the only hope for their son was to emigrate to America and start his life over. They told him that he should do this or he would "cease to receive money from us." However, the problem in the relationship between Friedrich and his parents was worked out without Engels having to leave England or being cut off from financial assistance from his parents. 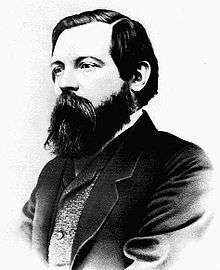 In July 1851, Friedrich Engels' father arrived to visit him in Manchester, England. During the visit his father arranged for Friedrich to meet Peter Ermen of the office of Ermond & Engels, move to Liverpool and to take over sole management of the office in Manchester. Starting with an article called "The Magyar Struggle", written on 8 January 1849, Friedrich Engels, himself, began a series of reports on the Revolution and War for Independence of the newly founded Hungarian Republic. Engels' articles on the Hungarian Republic became a regular feature in the Neue Rheinische Zeitung under the heading: "From the Theater of War." However, during the June 1849 Prussian coup d'état the newspaper was suppressed. After the coup, Marx lost his Prussian citizenship, was deported, and fled to Paris and then London. Engels stayed in Prussia and took part in an armed uprising in South Germany as an aide-de-camp in the volunteer corps of August Willich. Engels also brought two cases of rifle cartridges with him when he went to join the uprising in Elberfeld on 10 May. 1849. Later when Prussian troops came to Kaiserslautern to suppress an uprising there, Engels joined a group of volunteers under the command of August Willich, who were going to fight the Prussian troops. When the uprising was crushed, Engels was one of the last members of Willich's volunteers to escape by crossing the Swiss border. Marx and others became concerned for Engels' life until they finally heard from him. Engels traveled through Switzerland as a refugee and eventually made it to safety in England. 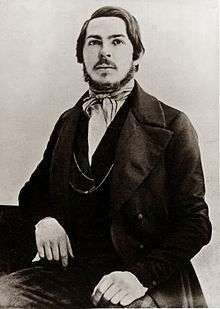 On 6 June 1849 Prussian authorities issued an arrest warrant for Friedrich Engels which contained a physical description as "height: 5 feet 6 inches; hair: blond; forehead: smooth; eyebrows: blond; eyes: blue; nose and mouth: well proportioned; beard: reddish; chin: oval; face: oval; complexion: healthy; figure: slender. Special characteristics: speaks very rapidly and is short-sighted." As to his "short-sightedness", Engels admitted as much in a letter written to Joseph Weydemeyer on 19 June 1851 in which he says he was not worried about being selected for the Prussian military because of "my eye trouble, as I have now found out once and for all which renders me completely unfit for active service of any sort." Once he was safely in Switzerland, Engels began to write down all his memories of the recent military campaign against the Prussians. This writing eventually became the article published under the name "The Campaign for the German Imperial Constitution." In order to help Marx with the new publishing effort in London, Neue Rheinische Zeitung Politisch-ökonomische Revue, Engels sought ways to escape the continent and travel to London. On 5 October 1849, Engels arrived in the Italian port city of Genoa. There, Engels booked passage on the English schooner, Cornish Diamond under the command of a Captain Stevens. The voyage across the western Mediterranean, around the Iberian Peninsula by sailing schooner took about five weeks. Finally, on 10 November 1849 the Cornish Diamond sailed up the River Thames to London with Engels on board. Once Engels made it to Britain, he decided to re-enter the Manchester company in which his father held shares, in order to be able to support Marx financially, so that Marx could work on his masterpiece Das Kapital. Engels didn't like the work but did it for the good of the cause. Unlike his first period in England (1843), Engels was now under police surveillance. He had "official" homes and "unofficial homes" all over Salford, Weaste and other inner-city Manchester districts where he lived with Mary Burns under false names to confuse the police. Little more is known, as Engels destroyed over 1,500 letters between himself and Marx after the latter's death so as to conceal the details of their secretive lifestyle. Despite his work at the mill, Engels found time to write his monumental work on Martin Luther, the Protestant Reformation and the 1525 revolutionary war of the peasants. This work was entitled The Peasant War in Germany. Engels also wrote some important newspaper articles such as "The Campaign for the German Imperial Constitution" which he finished in February 1850, and "On the Slogan of the Abolition of the State and the German 'Friends of Anarchy'" written in October 1850. In April 1851, Engels wrote the pamphlet, "Conditions and Prospects of a War of the Holy Alliance against France." When Louis Bonaparte carried out a coup against the French government and made himself president for life on 2 December 1851, Marx and Engels, like many people, were shocked. In condemning this action, Engels wrote to Marx about the coup on 3 December 1851. Engels characterised the coup as "comical" and referred to it as occurring on "the 18th Brumaire"—the date of the coup according to the 1799 republican calendar of France under Napoleon I. Marx was later to incorporate this comically ironic characterisation of Louis Bonaparte's coup into his essay about the coup. Indeed, Marx even called the essay The Eighteenth Brumaire of Louis Bonaparte again using Engels' suggested characterisation. Marx also borrowed Engels characterisation of Hegel's notion of the World Spirit that history occurred twice, "once as a tragedy and secondly as a farce" in the first paragraph of his new essay. Meanwhile, at the mill owned by his father in Manchester, Engels started working as an office clerk, the same position he held in his teens while in Germany where his father's company was based. However, Friedrich worked his way up to become a partner of the firm in 1864. Five years later, Engels retired from the business and could focus more on his studies. At this time, Marx was living in London but they were able to exchange ideas through daily correspondence. One of the ideas that Engels and Marx contemplated was the possibility and character of a potential revolution in the Russias. As early as April 1853, Engels and Marx anticipated an "aristocratic-bourgeois revolution in Russia which would begin in "St. Petersburg with a resulting civil war in the interior." The model for this type of aristocratic-bourgeois revolution in Russia against the autocratic czarist government in favour of a constitutional government had been provided by the Decembrist Revolt of 1825. Although an unsuccessful revolt against the czarist government in favour of a constitutional government, both Engels and Marx anticipated a bourgeois revolution in Russia would occur which would bring about a bourgeois stage in Russian development to precede a communist stage. By 1881, both Marx and Engels began to contemplate a course of development in Russia that would lead directly to the communist stage without the intervening bourgeois stage. This analysis was based on what Marx and Engels saw as the exceptional characteristics of the Russian village commune or obshchina. Although doubt was cast on this theory by Georgi Plekhanov, Plekhanov's reasoning was based on the first edition of Das Kapital (1867), which predated Marx's interest in Russian peasant communes by two years. Later editions of the text demonstrate Marx's sympathy for the argument of Nikolay Chernyshevsky, that it should be possible to establish socialism in Russia without an intermediary bourgeois stage provided that the peasant commune were used as the basis for the transition. In 1870, Engels moved to London where he and Marx lived until Marx's death in 1883. His London home during this period and until his death was 122 Regent's Park Road, Primrose Hill, NW1. 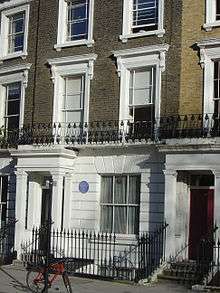 Marx's first London residence was a cramped apartment at 28 Dean Street, Soho. From 1856, he lived at 9 Grafton Terrace, Kentish Town, and then in a tenement at 41 Maitland Park Road from 1875 until his death. Mary Burns suddenly died of a heart disease in 1863, after which Engels became close with her younger sister Lydia ("Lizzie"). They lived openly as a couple in London and married on 11 September 1878, hours before Lizzie's death. After Marx's death, Engels devoted much of his remaining years to editing Marx's unfinished volumes of Capital. However, he also contributed significantly in other areas. Engels made an argument using anthropological evidence of the time to show that family structures changed over history, and that the concept of monogamous marriage came from the necessity within class society for men to control women to ensure their own children would inherit their property. He argued a future communist society would allow people to make decisions about their relationships free of economic constraints. 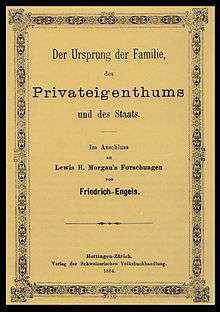 One of the best examples of Engels' thoughts on these issues are in his work The Origin of the Family, Private Property and the State. Engels died of throat cancer in London, 1895. Following cremation at Woking Crematorium, his ashes were scattered off Beachy Head, near Eastbourne as he had requested. Engels' interests included poetry, fox hunting, and hosting regular Sunday parties for London's left-wing intelligentsia where, as one regular put it, "no one left before two or three in the morning." His stated personal motto was "take it easy", while "jollity" was listed as his favourite virtue. This great lover of the good life, passionate advocate of individuality, and enthusiastic believer in literature, culture, art and music as an open forum could never have acceded to the Soviet Communism of the 20th century, all the Stalinist claims of his paternity notwithstanding. In that sense the latent rationality of Christianity comes to permeate the everyday experience of the modern world—its values are now variously incarnated in the family, civil society, and the state. What Engels particularly embraced in all of this was an idea of modern pantheism (or, rather, pandeism, a merging of divinity with progressing humanity, a happy dialectical synthesis that freed him from the fixed oppositions of the pietist ethos of devout longing and estrangement. "Through Strauss I have now entered on the straight road to Hegelianism... The Hegelian idea of God has already become mine, and thus I am joining the ranks of the 'modern pantheists,'" Engels wrote in one of his final letters to the soon-to-be-discarded Graebers [Wilhelm and Friedrich, priest trainees and former classmates of Engels]. Engels was a polyglot and was able to write and speak in languages including Russian, Italian, Portuguese, Irish Gaelic, Spanish, Polish, French, English and Milanese dialect. Vladimir Lenin wrote: "After his friend Karl Marx (who died in 1883), Engels was the finest scholar and teacher of the modern proletariat in the whole civilised world.... In their scientific works, Marx and Engels were the first to explain that socialism is not the invention of dreamers, but the final aim and necessary result of the development of the productive forces in modern society. All recorded history hitherto has been a history of class struggle, of the succession of the rule and victory of certain social classes over others." But Labour Party politician Tristram Hunt argues that Engels has become a convenient scapegoat, too easily blamed for the state crimes of the Soviet Union, Communist Southeast Asia and China. "Engels is left holding the bag of 20th century ideological extremism," Hunt writes, "while Marx is rebranded as the acceptable, postpolitical seer of global capitalism." Hunt largely exonerates Engels stating that "in no intelligible sense can Engels or Marx bear culpability for the crimes of historical actors carried out generations later, even if the policies were offered up in their honor." Other writers, while admitting the distance between Marx and Engels and Stalin, are less charitable, noting for example that the anarchist Bakunin predicted the oppressive potential of their ideas. "It is a fallacy that Marxism's flaws were exposed only after it was tried out in power.... [Marx and Engels] were centralisers. While talking about 'free associations of producers', they advocated discipline and hierarchy." Paul Thomas, of the University of California, Berkeley, claims that while Engels had been the most important and dedicated facilitator and diffuser of Marx's writings, he significantly altered Marx's intents as he held, edited and released them in a finished form, and commentated on them. Engels attempted to fill gaps in Marx's system and extend it to other fields. He stressed historical materialism in particular, assigning it a character of scientific discovery and a doctrine, indeed forming Marxism as such. A case in point is Anti-Dühring, which supporters of socialism, like its detractors, treated as an encompassing presentation of Marx's thought. And while in his extensive correspondence with German socialists Engels modestly presented his own secondary place in the couple's intellectual relationship and always emphasised Marx' outstanding role, Russian communists like Lenin raised Engels up with Marx and conflated their thoughts as if they were necessarily congruous. Soviet Marxists then developed this tendency to the state doctrine of Dialectical Materialism. In 2014 Engels' "magnificent beard" inspired a climbing wall sculpture in Salford. The 16 feet (4.9 m) high beard statue — a "symbol of wisdom and learning" — was planned to stand on the campus of the University of Salford. The arts company behind the piece, Engine, said that "the idea came from a 1980s plan to relocate an Eastern Bloc statue of the thinker to Manchester." The Holy Family was a book written by Marx and Engels in November 1844. The book is a critique on the Young Hegelians and their trend of thought which was very popular in academic circles at the time. The title was a suggestion by the publisher and is meant as a sarcastic reference to the Bauer Brothers and their supporters. The book created a controversy with much of the press and caused Bruno Bauer to attempt refuting the book in an article published in Wigand's Vierteljahrsschrift in 1845. Bauer claimed that Marx and Engels misunderstood what he was trying to say. Marx later replied to his response with his own article published in the journal Gesellschaftsspiegel in January 1846. Marx also discussed the argument in chapter 2 of The German Ideology. The Condition of the Working Class in England is a detailed description and analysis of the appalling conditions of the working class in Britain during Engels' stay in Manchester and Salford. The work also contains seminal thoughts on the state of socialism and its development. It was considered a classic in its time and must have been an eye-opener for most Germans. The work initially made rather little impact in England as it was not translated until the end of the nineteenth century. It was however very influential with historians of British industrialisation throughout the twentieth century. Popularly known as Anti-Dühring, Herr Eugen Dühring's Revolution in Science is a detailed critique of the philosophical positions of Eugen Dühring, a German philosopher and critic of Marxism. In the course of replying to Dühring, Engels reviews recent advances in science and mathematics seeking to demonstrate the way in which the concepts of dialectics apply to natural phenomena. Many of these ideas were later developed in the unfinished work, Dialectics of Nature. Three chapters of Anti-Dühring were later edited and published under the separate title, Socialism: Utopian and Scientific. In what he presented as an extraordinarily popular piece, Engels critiques the utopian socialists, such as Fourier and Owen, and provides an explanation of the socialist framework for understanding capitalism, and an outline of the progression of social and economic development from the perspective of historical materialism. The Origin of the Family, Private Property and the State is a work connecting capitalism with what Engels argues is an ever-changing institution – the family. It was written when Engels was 64 years of age and at the height of his intellectual power. It contains an historical view of the family in relation to issues of class, female subjugation and private property. 1 2 Norman Levine, Divergent Paths: The Hegelian Foundations of Marx's Method, Lexington Books, 2006, p. 92: "the Young never graduated from the gymnasium, never went to university..."
1 2 Merriam-Webster, Merriam-Webster at "Engels". 1 2 3 Hunt, Tristram (2009), Marx's General: The Revolutionary Life of Friedrich Engels, Metropolitan/Henry Holt & Co.
↑ Theories of Surplus Value, in Collected Works of Marx and Englels: Volumes 30, 31 and 32 (International Publishers: New York, 1988). ↑ A copy of Friedrich Engels' birth certificate is on page 577 of the Collected Works of Karl Marx and Friedrich Engels: Volume 2 (New York: International Publishers, 1975). ↑ Friedrich Engels. "Letters of Marx and Engels, 1845". Marxists.org. Retrieved 2010-02-13. 1 2 3 Elisabeth Engels' letter contained at No. 6 of the Appendix, Collected Works of Karl Marx and Friedrich Engels: Volume 38 (International Publishers: New York, 1982) pp. 540–541. 1 2 3 4 5 6 "Lenin: Friedrich Engels". Marxists.org. Retrieved 2010-02-13. ↑ Progress Publishers. "Preface by Progress Publishers". Marxists.org. Retrieved 2010-02-13. ↑ "Footnotes to Volume 1 of Marx Engels Collected Works". Marxists.org. 15 November 1941. Retrieved 2010-02-13. ↑ Heinrich Gemkow et al., Friedrich Engels: A Biography (Verlag Zeit im Bild: Dresden, Germany, 1972) p. 53. 1 2 3 4 "Biography on Engels". Marxists.org. Retrieved 2010-02-13. 1 2 "Legacies – Work – England – Manchester – Engels in Manchester – Article Page 1". BBC. Retrieved 2010-02-13. ↑ Wheen, Francis Karl Marx: A Life, p. 75. ↑ Heinrich Gemkow et al., Friedrich Engels: A Biography (Verlag Zeit im Bild: Dresden, Germany, 1972) pp. 53–54. 1 2 "Legacies – Work – England – Manchester – Engels in Manchester – Article Page 2". BBC. Retrieved 2010-02-13. ↑ Carver, Terrell (2003). Engels: A Very Short Introduction. Oxford University Press. pp. 71–72. ↑ Draper, Hal (July 1970). "Marx and Engels on Women's Liberation". International Socialism. Retrieved 2011-11-29. ↑ "Outline of a Critique of Political Economy," Collected Works of Karl Marx and Friedrich Engels: Volume 3 (International Publishers: New York, 1975), pp. 418–445. ↑ The Condition of the Working Class in England, in the Collected Works of Marx and Engels: Volume 4 (International Publishers: New York, 1975) pp. 295–596. ↑ Karl Marx. "Introduction to the French Edition of Engels' by Karl Marx 1880". Marxists.org. Retrieved 2010-02-13. ↑ P. N. Fedoseyev, Karl Marx: A Biography (Progress Publishers: Moscow, 1973) pp. 41–42 & 49. ↑ P. N. Fedoseyev, et al., Karl Marx: A Biography, p. 71. ↑ Friedrich Engels, "The Condition of the Working Class of England," Collected Works of Karl Marx and Friedrich Engels: Volume 4 (International Publishers: New York, 1975) pp. 295 through 596. ↑ P. N. Fedoseyev, et al., Karl Marx: A Biography (Progress Publishers: Moscow, 1973) pp. 82–83. ↑ Karl Marx and Friedrich Engels, Collected Works: Volume 4, p. 424. ↑ The Holy Family, Collected Works of Karl Marx and Friedrich Engels: Volume 4, pp. 3 through 211. ↑ P. N. Fedoseyev, et al., Karl Marx: A Biography (Progress Publishers: Moscow, 1973) p. 60. ↑ P. N. Fedoseyev et al., Karl Marx: A Biography pp. 57–58. ↑ Karl Marx and Friedrich Engels, "Letter from Marx to Ruge" (15 January 1845) contained in Collected Works: Volume 38, p. 15. ↑ Heinrich Gemkow et al., Friedrich Engels: A Biography p. 625. ↑ Heinrich Gemkow et al. Friedrich Engels: A Biography p. 625. ↑ German Ideology is located in the Collected Works of Karl Marx and Friedrich Engels pp. 19 through 539. ↑ Heinrich Gemkow et al., Friedrich Engels: A Biography p. 101. ↑ Isaiah Berlin, Karl Marx: His Life and Environment (Oxford University Press: Oxford, England, 1963) pp. 159–160. ↑ Isaiah Berlin, Karl Marx: His Life and Environment p. 160. ↑ Karl Marx and Friedrich Engels, Manifesto of the Communist Party contained in the Collected Works Volume 6 pp. 477–517. ↑ Karl Marx and Friedrich Engels, "Banquet in Gűrzenich" contained in the Collected Works: Volume 9 (International Publishers: New York, 1977) p. 490. ↑ Elisabeth Engels' letter to Friedrich Engels contained at No. 8 of the Appendix in the Collected Works of Karl Marx and Friedrich Engels: Volume 38, p. 543. 1 2 Elisabeth Engels' letter contained at No. 8 of the Appendix in the Collected Works of Karl Marx and Friedrich Engels: Volume 38, p. 543. ↑ Friedrich Engels letter to Karl Marx dated 6 July 1851 and contained at No. 186 of the Collected Works of Karl Marx and Friedrich Engels: Volume 38, p. 378. ↑ Karl Marx and Friedrich Engels, "The Magyar Struggle" contained in Collected Works: Volume 8, pp. 227–238. ↑ See Karl Marx and Friedrich Engels, Collected Works: Volume 8, pp. 451–480 and Volume 9, pp. 9–463. ↑ "Engels, Friedrich (encyclopedia)". Marxists.org. Retrieved 2010-02-13. ↑ Isaiah Berlin, Karl Marx: His Life and Environment, 4th ed. 1978, New York and Oxford: Oxford University Press, 1996, p. 130, ISBN 978-0-19-510326-7. ↑ Mike Rapport, 1848 Year of Revolution, London: Little Brown, 2008, p. 342, ISBN 978-0-316-72965-9. ↑ Karl Marx and Friedrich Engels, "Elberfeld" contained in the Collected Works: Volume 9 (International Publishers: New York, 1977) p. 447. ↑ Heinrich Gemkow, et al., Friedrich Engels: A Biography (Verlag Zeit im Bild: Dresden, 1972) p.205. ↑ "Letter from Engels to Jenny Marx" (25 July 1849) contained in the Collected Works: Volume 38 p. 202-204. ↑ Friedrich Engels letter contained at No. 183 of the Collected Works of Karl Marx and Friedrich Engels: Volume 38, p. 370. ↑ Karl Marx and Friedrich Engels, Collected Works: Volume 10, p. 147. ↑ See the "Letter to from Engels to George Julian Harney" dated 5 October 1849 in the Collected Works of Karl Marx and Friedrich Engels: Volume 38 p. 217. ↑ Karl Marx and Friedrich Engels, "Letter from Engels to George Julian Harney (5 October 1849) Collected Works: Volume 38 p. 217. ↑ Heinrich Gemkow et al., Friedrich Engels: A Biography p. 213. ↑ "Legacies – Work – England – Manchester – Engels in Manchester – Article Page 4". BBC. Retrieved 2010-02-13. ↑ "Legacies – Work – England – Manchester – Engels in Manchester – Article Page 5". BBC. Retrieved 2010-02-13. ↑ "The Peasant War in Germany" and s contained in the Collected Works of Karl Marx and Friedrich Engels: Volume 10 pp. 397 through 482. ↑ The article "On the Slogan of the Abolition of the State and the German 'Friends of Anarchy'" is contained in the Collected Works of Marx and Engels: Volume 10 p. 486. ↑ The pamphlet "Conditions and Prospects of a War of the Holy Alliance against France" is contained in the Collected Works of Karl Marx and Friedrich Engels: Volume 10 p. 542. ↑ Friedrich Engels' letter to Karl Marx dated 3 December 1851 contained in the "Collected Works of Karl Marx and Friedrich Engels: Volume 38", p. 503. ↑ Friedrich Engels' letter to Karl Marx contained in the "Collected Works of Karl Marx and Friedrich Engels: Volume 38", p. 503. ↑ See note 517 located at page 635 in the "Collected Works of Karl Marx and Friedrich Engels: Volume 38. ↑ Karl Marx, "The Eighteenth Brumaire of Louis Bonaparte" contained in the Collected Works of Karl Marx and Friedrich Engels: Volume 11, p. 98. ↑ Karl Marx, "The Eighteenth Brumaire of Louis Bonaparte" contained in the Collected Works of Karl Marx and Friedrich Engels: Volume 11, p. 103. ↑ See the letter from Friedrich Engels to Joseph Weydemeyer dated April 12, 1853 contained in the Collected Works of Karl Marx and Friedrich Engels: Volume 39 (New York: International Publishers, 1983) pp. 305–306. ↑ Letter from Fredereick Engels to Joseph Weydemeyer dated 12 April 1853 contained in the Collected Works of Karl Marx and Friedrich Engels: Volume 39, p. 306. ↑ W. Bruce Lincoln, The Romanovs: Autocrats of All the Russias (New York: Dial Press, 1981) pp. 408–413. ↑ See the letter from Karl Marx to Vera Zasulich contained in the Collected Works of Karl Marx and Friedrich Engels: Volume 46, (New York: International Press, 1992) pp. 71–72 and Engels' "Preface to the Russian Edition of 1882" in The Communist Manifesto. ↑ Gareth Stedman Jones, note on Engels' "Preface to the Russian Edition of 1882" in The Communist Manifesto (London: Penguin Books, 2002). ↑ "Photos of Marx's Residence(s)". Marxists.org. Retrieved 2010-02-13. ↑ Henderson, William Otto (1976). The Life of Friedrich Engels. Psychology Press. p. 567. ISBN 978-0-7146-3040-3. ↑ Samuel Hollander (2011). Friedrich Engels and Marxian Political Economy. Cambridge University Press. p. 358. ISBN 978-1-139-49844-9. 1 2 "Letters: Marx-Engels Correspondence 1895". Marxists.org. Retrieved 2010-02-13. ↑ Kerrigan, Michael (1998). Who Lies Where – A guide to famous graves. London: Fourth Estate Limited. p. 156. ISBN 1-85702-258-0. ↑ Manchester Photographers by Gillian Read. Ed. Royal Photographic Society's Historical Group, 1982: „George Lester, 51, King Street , Manchester (1863–1868). See the photo in Jenny Marx album too. ↑ Engels, Friedrich. "Friedrich Engels' "Confession"". Marxists Internet Archive. Archived from the original on 27 April 2014. Retrieved 2014-10-25. ↑ Marx's General: The Revolutionary Life of Friedrich Engels By Tristram Hunt. 2010. p. 43. ↑ Paul Lafargue; Jacques Bonhomme (15 August 1905). "Friedrich Engels". Marxists Internet Archive (from The Social Democrat journal). Marxists Internet Archive. Retrieved 15 April 2013. ↑ Vladimir Ilyich Lenin. "Friedrich Engels". Marxists.org. Retrieved 2011-01-25. ↑ "Friedrich Engels' beard inspires climbing sculpture in Salford"
1 2 "The Holy Family by Marx and Engels". Marxists.org. Retrieved 2010-02-13. ↑ Griffin, Emma. "The 'industrial revolution': interpretations from 1830 to the present". Retrieved 9 March 2013. Wikimedia Commons has media related to Friedrich Engels. Friedrich Engels, “On Rifled Cannon," articles from the New York Tribune, April, May and June 1860, reprinted in Military Affairs 21, no. 4 (Winter 1957) ed. Morton Borden, 193–198.